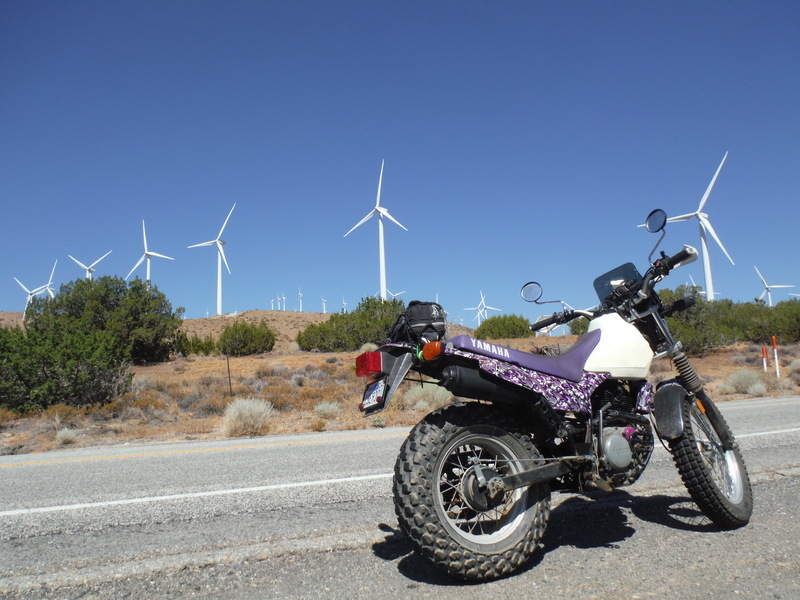 Last weekend, I took a day trip to Tehachapi, California to pick up my new rear rack for the TW200. It was a 215 miles round trip for me. I have asked one of the forum members if he could fix my rack since it was giving me a bruise on the back of my leg when I use the kick starter. Instead of fixing it, he built me an entirely new one from scratch once he heard that I will be taking a year long trip starting May of next year. Once he realize what I had and what I will need, he developed a two tier based system for the rear rack. One will be small but strong mounted to the bike, the second one will be larger to hold the Rotopax for fuel and gears, but can be removed when not needed for a long trip. I gave myself plenty of time to get there and of course I was early as usual. So I decided to do some sightseeing. 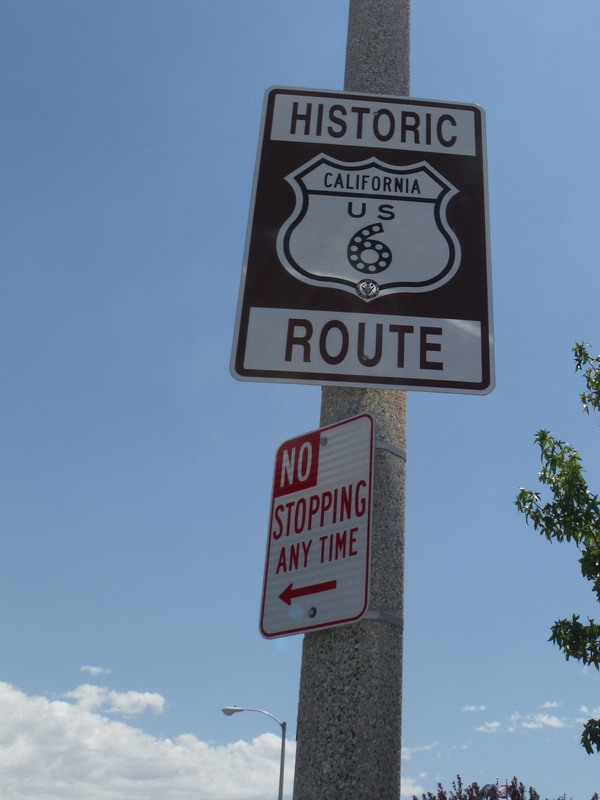 The town of Tehachapi is 35 miles east of Bakersfield and west of Mojave. One theory is that the word “Tehachapi” derive from the Kawaiisu language which means “hard climb”. The Tehachapi area is known for the nearby Tehachapi Loop and the Tehachapi Pass Wind Farm. 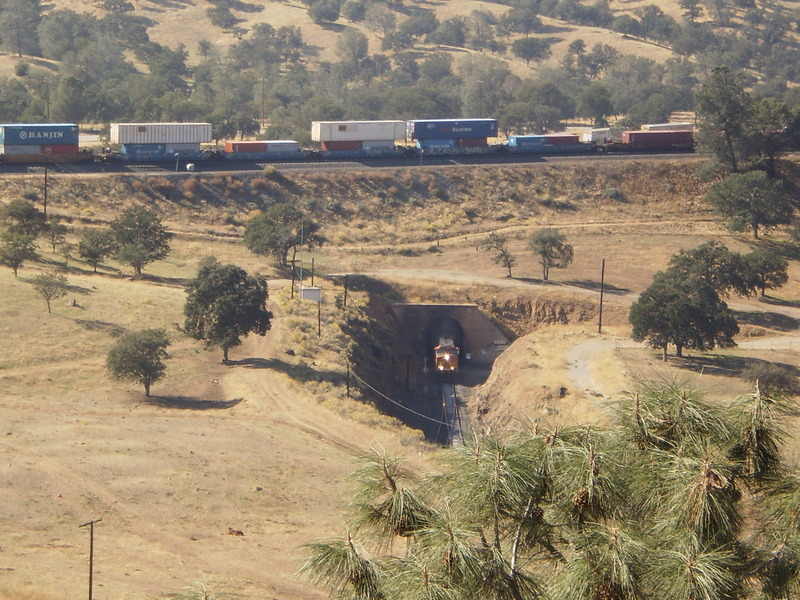 The Tehachapi Loop is one of the engineering fest of its day; it was built by Southern Pacific Railroad in 1876. The loop gains 77 feet in elevation as the railroad track climbs at a steady 2% grade. It was designed to slow the momentum of the east bound trains as it travel down the mountain to Bakersfield. Basically, a train that is more than 4,000 feet long will passes over itself going around the loop. The Tehachapi Pass Wind Farm was the first large-scale wind farms installed in the United States and the second largest with about 5,000 wind turbines but it not the most famous one. The most famous one the San Gorgonio Pass wind farm which has been featured in music video and movies. The Tehachapi Pass Wind Farm produces about 800 million kWh of electricity each year, which is enough to meet the electricity needs of 350,000 people. On the way home, I decided to take a different way home to check out a segment of one of the US longest highway that used to route from Long Beach, California to Provincetown, Massachusetts. This is one of the highways that I want to travel on when I take my trip next year. The section I went on goes through the town of Palmdale and Lancaster which are the homes of the aerospace industries such as Lockheed and Boeing. Sadly, there wasn’t much to look at. At least I can say that I was on this road. I would love to have you as a guest writer on the Stand Up To Cancer blog to help promote the ACS viewing party you are attending. I am having trouble tracking down your email address. Please reach out to me at lcobb@su2c.org and and we can discuss the next steps! Looking forward to hearing from you. 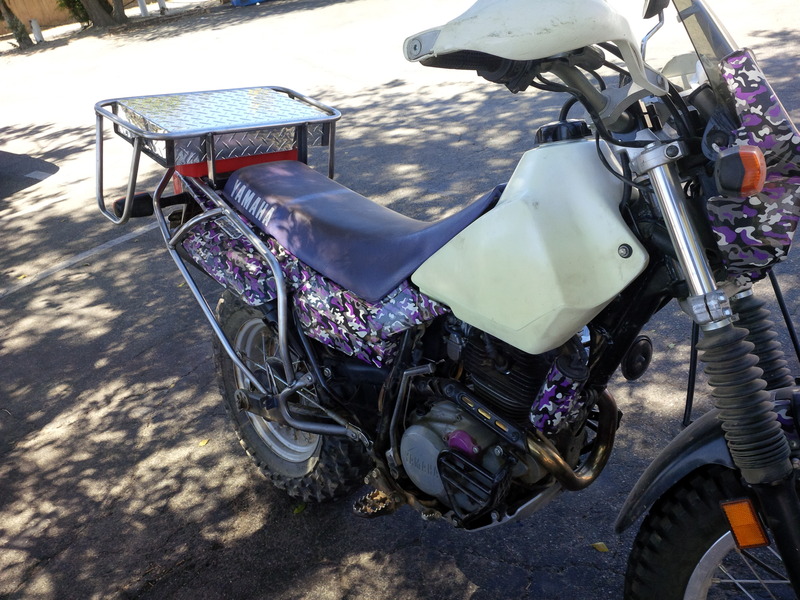 Hmm…I see from your ABOUT section your name is: is Ginamarie Austin but most of my motorcycle friends call me Purple. I think we may have had an issue with the ACS submission form, because I found your story, but it was connected to a different name! My apologies. Hoping to hear from you. No worry Louise…I sent you an email in response your invitation…I would be honored to be a guest blogger. Now that’s what i call tire. that fat tire on the back was awesome. looks like you wont be needing a change tire for 10 years on that. Do you also have racks on the side? Thank you Rodney, this bike the Yamaha TW200 is known for the fat tire…we can pretty much ride everywhere on those tires. I actually swap out the front tire for a Shinko Trial tire which make for a better handling. Yes, I do have a custom rack for this bike to handle the tail bag and the panniers that was built by another TW rider. This day trip was about to meet the person who made the rack and pick it up.